I think our modern buildings would escape relatively unscathed as the building regulations require that they are strengthened to prevent disproportional collapse in the event of an explosion or accident. This additional strength and robustness this ensures will prevent excessive damage in the event of a small earthquake. However our older buildings would suffer quite badly. Buildings which date from the Georgian and Victorian times (1760’s to 1900) are particularly susceptible to damage from earth movements. This is because they were constructed very poorly from an engineering view point. Most of these buildings have little or no foundations, they were constructed with little connection between the front walls and the flank walls and the facade walls are very poorly connected to the floors and therefore offer little lateral resistance. Because the walls are solid, with no cavity, water ingress can be a problem and with the timber floors weakly built into these damp walls the ends of the floor joists are susceptible to rot. If this happens the front wall can collapse as it is no longer restrained by the floors. 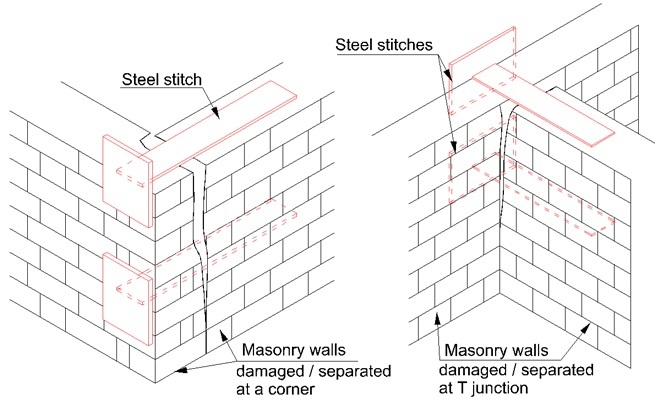 This is the same collapse mechanism as occurred in the World Trade Center buildings attacks when the fire weakened the floors and the walls (the outer walls were load bearing steel columns) were no longer restrained and therefore couldn’t support the load from above. I have been involved in many building projects where as part of the refurbishment of these older buildings we strengthened them as they were badly cracked. We strengthened the foundations by underpinning. We increased the stability of the building by strapping the front and rear walls to the side walls. 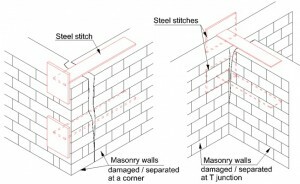 See sketch at the end of this post where steel plates are used to tie the corner junctions together. We also had to replace the ends of the floor joists and then securely fix them to the wall using stainless steel rods. See you tube video below for a demonstration of this technique. Restraining wall. Unfortunately relatively few of our older building stock have been refurbished to this extent and we are therefore very lucky that Britain and Ireland are unlikely to be hit by even a small earthquake, although fingers crossed.